RECESSED Recessed screws are now available in various shapes. They have a cavity formed in the head and require a specially shaped screwdriver. The clutch tip (fig. 1-71) is one shape, but the more common include the Phillips, Reed and Prince, and newer Torq-Set types (fig. 1-73). The most common type of screw found is the Phillips head. This requires a Phillips-type screwdriver (fig. 1-71). Phillips Screwdriver The head of a Phillips-type screw has a four-way slot into which the screwdriver fits. This prevents the screwdriver from slipping. Three standard-sized Phillips screwdrivers handle a wide range of screw sizes. Their ability to hold helps to prevent damaging the slots or the work surrounding the screw. It is a poor practice to try to use a standard screwdriver on a Phillips screw, because both the tool and screw slot will be damaged. 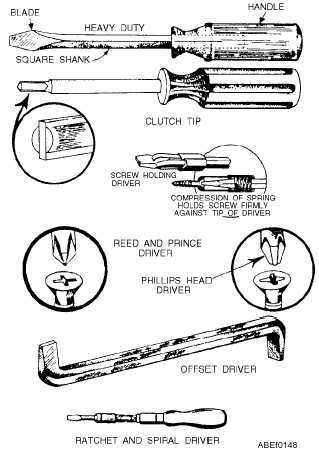 Reed and Prince Screwdriver Reed and Prince screwdrivers are not inter- changeable with Phillips screwdrivers. Therefore, always use a Reed and Prince screwdriver with Reed and Prince screws, and a Phillips screwdriver with Phillips screws, or a ruined tool or ruined screwhead will result. To distinguish between these similar screwdrivers, refer to figure 1-74. 1-45 Figure 1-71.Types of screwdrivers. Figure 1-72.Positioning screwdrivers. 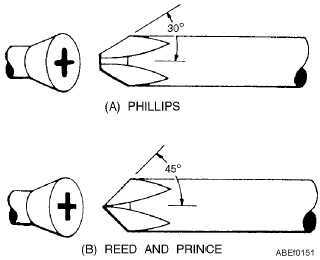 Figure 1-73.Comparison of Phillips, Reed and Prince, and Torq-Set screwheads. Figure 1-74.Matching cross-slot screws and screwdrivers.